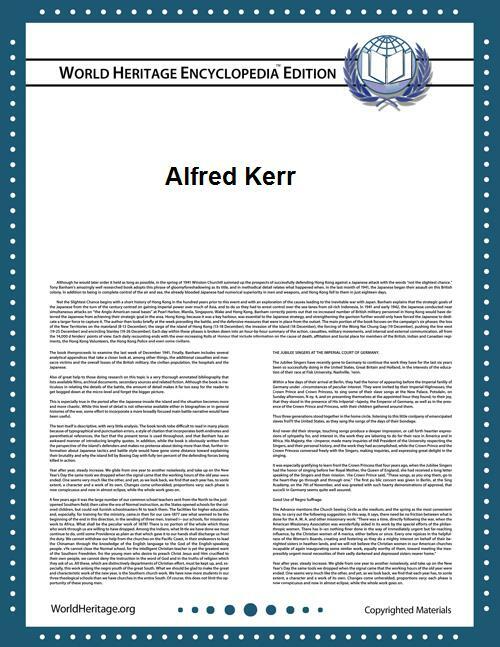 Alfred Kerr (25 December 1867 – 12 October 1948), born Alfred Kempner, was an influential German-Jewish theatre critic and essayist, nicknamed the Kulturpapst ("Culture Pope"). Kerr was born into a prosperous family in Breslau, Silesia, taking the surname Kerr in 1887, and making the change officially in 1909. He studied literature in Berlin with Erich Schmidt. He subsequently was a reviewer for numerous newspapers and magazines. With the publisher Paul Cassirer he founded the artistic review Pan in 1910. Kerr was noted for his treatment of drama criticism as another branch of literary criticism. As his fame grew he engaged in polemics, with the critics Maximilian Harden, Herbert Ihering and Karl Kraus in particular. In the 1920s he was hostile to Bertolt Brecht, and assailed him with accusations of plagiarism. In 1933 Kerr, his wife, Julia, and his children fled Germany for France via Czechoslovakia and Switzerland. They moved on to London in 1935. These years of exile were described, from a child's perspective, by Kerr's daughter in her books When Hitler Stole Pink Rabbit and The Other Way Round. His books were amongst those burnt in May 1933 by the Nazis when they came to power; Kerr had attacked the Nazi Party publicly, and he had already gone into exile with his family. After visiting Prague, Vienna, Switzerland, and France, he came to London in 1935 where he settled, in penury. He was a founder of the Freier Deutschen Kulturbund, and worked for the German PEN club. An old feud with Karl Kraus worked against him at the BBC. Kerr took British citizenship in 1947. 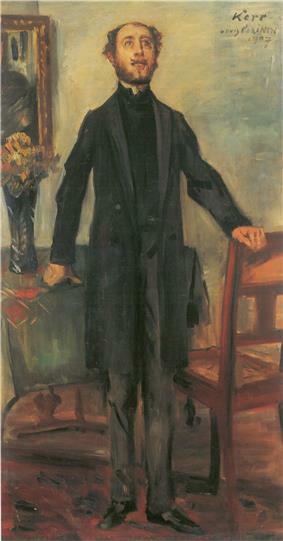 In 1948 he visited Hamburg at the start of a planned tour of several German cities but suffered a stroke, and then decided to end his own life (overdose of veronal procured for him by his wife). 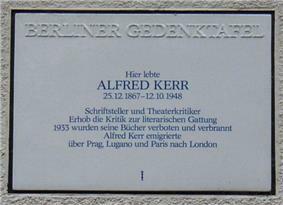 The Alfred-Kerr-Preis für Literaturkritik was established in 1977. After the publication of Wo liegt Berlin in 1997 (a bestseller) his works are more widely read in Germany and an edition is in progress. His son Michael Kerr was a prominent British lawyer. His daughter Judith Kerr wrote a three-volume autobiography and the children's book The Tiger Who Came To Tea; the writer Matthew Kneale is her son with Nigel Kneale, the writer of Quatermass scripts. Godwi. Ein Kapitel deutscher Romantik (1898). Dissertation on Clemens Brentano. Ich sage, was zu sagen ist: Theaterkritiken 1893-1919. Werke Band VII, 1. German Writers in French Exile, 1933-1940, by Martin Mauthner (London: 2007), ISBN 9780853035404.